What is common leaf spot? Common leaf spot of strawberry (also known as Mycosphaerella leaf spot, Ramularia leaf spot, strawberry leaf spot, bird’s-eye spot, gray spotness, and white spot) is a common fungal leaf disease that affects both wild and cultivated strawberries throughout the world. Common leaf spot was once the most economically important strawberry disease, but the use of resistant strawberry varieties/cultivars and improvements in methods for growing strawberries have been effective in managing the disease and reducing its impact. Today, the disease is often a cosmetic problem and typically has little impact on yield or fruit quality. What does common leaf spot look like? 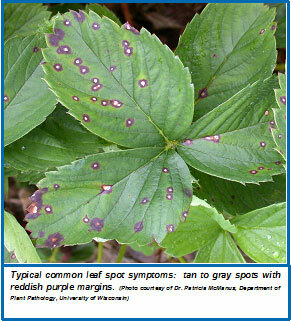 Symptoms of common leaf spot can occur on leaves, fruits, berry caps, petioles, and runners. The most noticeable symptoms of the disease are small, ro und, necrotic (i.e., dead) spots on strawberry leaves. Initially, these spots develop on the upper leaf surface and are deep purple to red in color. The spots eventually develop tan, gray or almost white centers with distinct reddish-purple to brown borders. During warm, humid weather, uniformly rusty-brown spots without purple margins or light colored centers may develop instead. Spots can occur on the undersides of the leaves as well, but these spots tend to be less vibrant in color. As the disease progresses, spots enlarge to ⅛ to ¼ inch in diameter and may merge together, in extreme cases leading to leaf death. Spots on berry caps, petioles, and runners resemble those produced on upper leaf surfaces. Shallow, black spots (¼ inch in diameter) may develop on infected fruits, and are often surrounded by brown or black, leathery tissue. Where does common leaf spot come from? Common leaf spot is caused by the fungus Mycospharella fragariae, which can enter a garden on infected strawberry plants or via windblown spores from nearby strawberries. Once introduced into a garden, the fungus is spread predominantly by splashing water from rain or sprinklers used for watering. M. fragariae is most active when temperatures range from 65°F to 75°F, with periods of high rainfall and humidity. M. fragariae survives the winter on dead strawberry leaves and other plant parts, and is moved to new foliage in the spring by early season rains. How do I save strawberry plants with common leaf spot? Once common leaf spot develops on strawberry plants, the plants cannot be cured. If the disease is detected early, its development may be slowed using fungicides. Keep in mind however, that common leaf spot is often merely a cosmetic issue and the use of fungicides may not be warranted. If you decide that fungicide treatments are needed, select a product that is labeled for use on strawberries and that contains captan, myclobutanil or copper as the active ingredient. Use copper-containing fungicides only prior to flowering. If you decide to use a myclobutanil-containing product, alternate applications of this product with applications of a second fungicide containing another active ingredient. This will help prevent selection of myclobutanil-resistant variants of the common leaf spot pathogen. Be sure to read and follow all instructions on the label(s) of the fungicide(s) that you select to ensure that you use the product(s) in the safest and most effective manner possible. How can I prevent common leaf spot in the future? When establishing your strawberry patch, consider planting resistant strawberry varieties and use certified, disease-free nursery stock. Examples of resistant varieties include ‘Crimson King’, ‘Earliglow’, ‘Glooscap’, ‘Ogallala’, and ‘Ozark Beauty’. Plant strawberries in full sunlight, in well-drained soils, and with proper spacing to optimize air circulation and create a drier environment that is less favorable for the common leaf spot pathogen. See University of Wisconsin bulletin A1597 (“Growing Strawberries in Wisconsin”) available at http://learningstore.uwex.edu for additional details on proper planting. Once plants are in the ground, avoid overhead watering (i.e., DO NOT use a sprinkler) as this will splash the common leaf spot pathogen from plant to plant, and provide a wet environment that is more favorable for the fungus to infect. Instead, use a drip or soaker hose for watering. For similar reasons, DO NOT work in your strawberry patch (e.g., weeding, thinning plants or harvesting fruit) when it is wet; wait until the patch is dry. For June-bearing strawberries, bed renovation techniques (in particular mowing) can be useful in managing common leaf spot. See University of Wisconsin bulletin A1597 (mentioned above) for details on proper renovation techniques. At the end of the growing season, remove strawberry plant debris to minimize sites where the fungus can survive the winter. Deep bury, burn (where allowed by local ordinance) or hot compost this material.